The Redwork Series documents sometimes mundane details of my life as a parent. Combined with crying children, lack of sleep, relationship changes, and other external stressors, early parenthood becomes a sort of flawed madness which I work capture in this series. 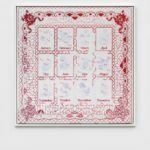 Each piece incorporates traditional stitching techniques, invented needlework techniques, and data drawn from my daily life as a parent. The materials and embroidery styles directly represent details of my experience in parenthood. 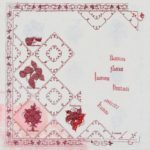 This series is made in a style called redwork. 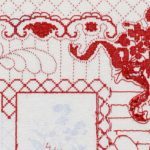 Redwork embroidery is quite literally red work; all the floss is red. 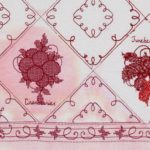 It is a traditional European style of embroidery generally used for very domestic needlework (hand towels, aprons, tablecloths). 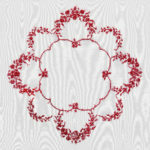 It is stitched with red floss on white or natural colored fabric. Historically embroidery was a hobby of the upper classes and royalty. The cost of the silk floss and materials was very high until a color fast red dye developed. This allowed the middle classes to take up embroidery as a hobby. 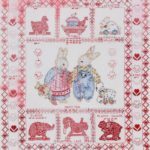 I stitch in redwork because it is recognized as a domestic and middle class style of needlework which reflects my life as a parent. In addition to working the series in redwork, I stitch each piece both front-wards and backwards. Generally the skill of a stitcher is judged by examining the back of their work. This means that both the front and backside of embroidery pieces must be well stitched to be acknowledged as a well made work. This feels very similar to parenthood. Thru social media and mommy bloggers, Martha Stewart culture and playground politics, our culture builds an impossible standard for parenthood much like making work that is as well executed on the back as it is on the front. By stitching the work in both manners, I aim to reveal my flaws as a stitcher and parent. This work is an effort to reveal my true self. For Looks Like You’ve Got Your Hands Full I’ve tracked each time someone has commented “looks like you’ve got your hands full” to me over the course of 2017. It won’t be completed until the year ends. 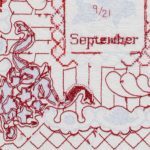 I then stitched each date onto the respective months of my vintage stamped for embroidery tablecloth. I noticed that people repeat this specific phrase to me while I’m walking with my kids, or carrying them at the supermarket. Even at restaurants and the car wash. It’s interesting that the phrase is so consistently the same and seems to come from the same place within each person. It seems like a desire to engage and acknowledge my parenthood and the challenges of parenting young children, yet the conversation rarely progresses beyond this comment. It also seems that it occurs during a very specific period of time in parenthood. I doubt I will hear this comment as frequently when my children are teenagers. In a way this phrase is similar to a popular song that you hear all the time for a few months and then years later it reminds you of that specific Summer. 5 Days My One Year Olds Cried documents time where I was learning and growing as a parent. 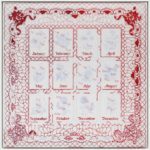 Over the period of five days I tracked each time my then one year old twins cried. The piece is flawed and incomplete. One skein of red floss bled and stained the table cloth evoking a sense of interruption and imperfection. 5 Days works to capture that overwhelming emotion of being at a loss as to what to do while navigating unfamiliar terrain. It is a sort of snapshot of sitting at the table, with the nth cup of coffee at hand, hearing a child cry, struggling with uncertainty and the feeling of failing. The Redwork series is a very intimate glimpse of my experience as a parent, which is both highly universal and very specific to me and my life in the past two years. It aims to reflect the manner in which I navigate the world differently in my newish role as Mommy, and how the lens of interpersonal engagement shifted in the environment around me in response to this.